Twitter announced in February that it had blocked 125,000 accounts for promoting mostly ISIS-related terrorist attacks. 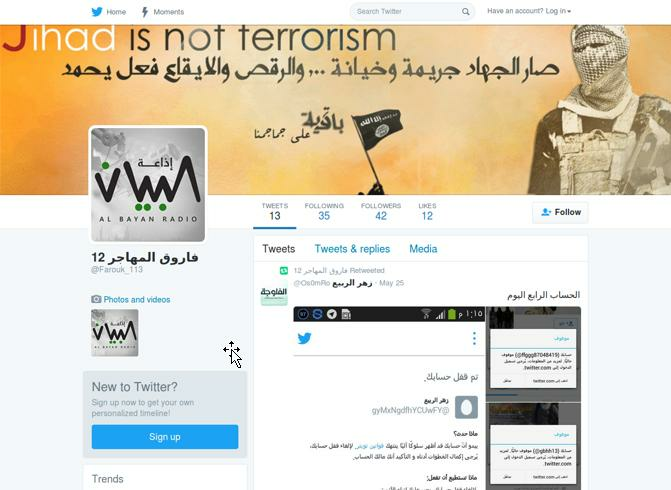 While the company may have taken a stand against terrorist propaganda on the service, it also draws a hard line on using Twitter to spread malware that could be used to identify potential ISIS recruits. Researchers at Intel Security’s McAfee believe that unskilled ‘script kiddies’ are behind a malicious Android app that appears to be designed to lure and spy on anyone in the Middle East, Europe and North America who might be interested in terrorism. Exactly who was behind the malware isn’t clear, though Intel guesses it could just as likely be a government agency as a terror cell looking for new recruits. The malicious app was dressed up as Al Rayan Radio, a legitimate radio player aimed at listeners in the Gulf region, however in its trojan form it promised terrorist propaganda, according to Intel, allowing the app’s makers to spy on the device’s user. Several Twitter accounts have been posting a direct link guiding users to download a malicious Android application masquerading as the legitimate radio player Al Rayan Radio. Users are promised and provided radicalized propaganda, but are secretly made susceptible to cyber surveillance through their mobile devices. Intel’s researchers believe the authors of the app aren’t skilled because the hidden functions are actually a well-known remote access tool that’s sold as a service to people who lack the time or skills to create their own software. Intel’s label for it is Android/SandroRAT.C!Gen. McAfee has previously linked to Android malware aimed designed to steal SMS messages from devices with banking apps installed. The malware was until recently being distributed via shortened links posted on Twitter by two accounts that the social network has now deactivated. These included @farouk_112 and @farouk_113. The malware offered the developers several privileges in the Android permission framework, including access to the device’s camera and microphone, the ability to read and write SMS, and access to any files stored on the external SD card. Additionally, the malware collects encrypted data from WhatsApp. Intel’s researchers don’t know who’s behind this malware but speculate it could be a terrorist group seeking to recruit new members, a terrorist group gathering information on a rival, or an intelligence agency keen on surveilling would-be terrorists. However, the commodity malware suggests the attackers aren’t particularly sophisticated, it noted, which is usually a sign of how well-funded the attacker is. Intel reported in May that it had seen an alarming increase in the use of mobile malware for intelligence gathering in the trouble-stricken Middle East over the past few years.